Since its creation in the early 1930s, the McDonald Collection has been Oregon State University’s primary rare book collection. The 400 linear foot collection is home to more than 2,500 rare books, artifacts, and fine bindings including several examples of incunabula and manuscripts dating from the Middle Ages, numerous first-edition novels, Sumerian and Akkadian cuneiform tablets, and a rare edition of The Collected Works of Abraham Lincoln featuring original documents from the Lincoln presidency. 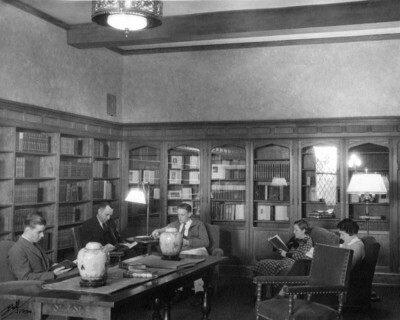 After the death of Mary McDonald in 1936, the McDonald Collection remained in the first university library, Kidder Hall, its growth supported by the McDonald Endowment. The collection was eventually moved from Kidder to the new Kerr Library. Then, in 1999, construction on the Valley Library was completed and the McDonald Collection was moved into the new secure, temperature and humidity-controlled space where it remains today. As a part of the OSU Libraries Special Collections & Archives Research Center, the McDonald Collection is overseen by the SCARC staff which has taken responsibility for maintaining the collection, acquiring new items, and making the McDonald holdings available to students and scholars.